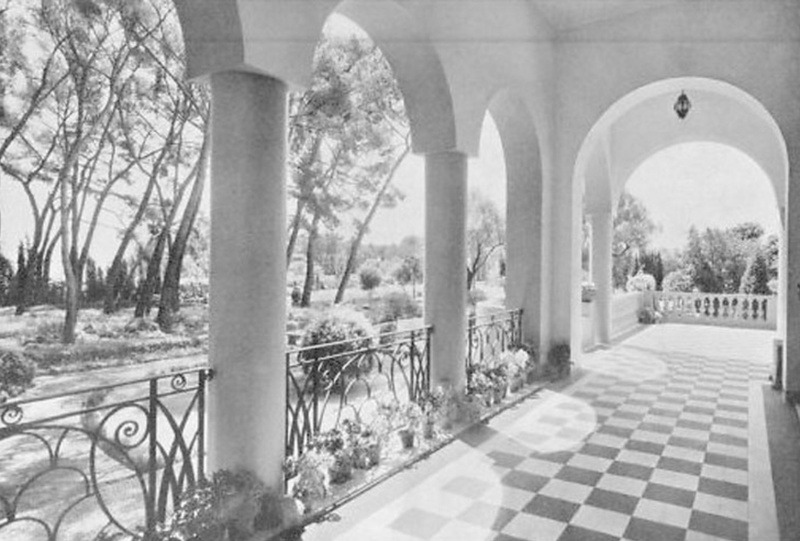 It was for his third wife, Andrée Caron that the Aga Khan III bought the old Villa Taormina in 1929, which was modified in the 1900’s for Mrs Bertrand. A few years earlier, the chief of the Ismaeliens married Andrée in Aix-les-Bains, who he knew since she was 12 years old and was the daughter of some of his friends. Later she would go on to work as the head of a fashion house in Paris. After renaming the villa Jane Andrée, the new owner made several transformations to the property. He first of all bought four neighbouring pieces of land which gave him a park of approximately 6000 m², wiped out the tennis court to make a larger entrance and to plant a large number of trees such as cedars, mimosas, apple trees, olive trees, etc. The property itself grew in size by an extra wing and also an art deco/néo provencal style arcade loggia. The interior of the property was luxuriously decorated with Louis XV pieces, carpet from the French and Flamand schools of the XVII and XVIII centuries, but there was also Persian paravents and Indian coffee tables which had been engraved, all of this showed that the religious leader had a taste for French culture along with the oriental culture. Following his divorce from Andrée Caron in 1943, the Aga Khan leaves the property definitively which his former wife kept for more than 40 years. Abandoned for several years, the villa Jane Andrée became a home for squatters, waiting for a saviour to come and restore her into her previous prestigious glory. In recent years, the sumptuous villa has been fully restored to its full glory. This is not a listing, please refer our selection of villas to rent on the Cap d’Antibes.